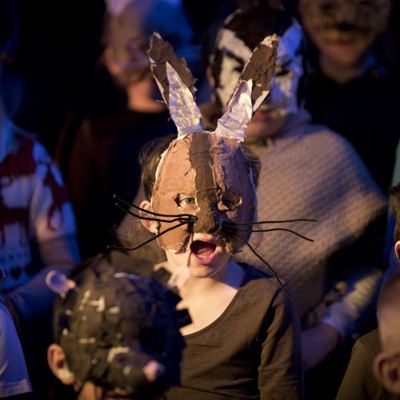 In February 2013, The Bridgewater Hall Learning and Participation department worked with Chetham’s School of Music and Manchester Cathedral to stage a community production of Benjamin Britten’s opera Noye’s Fludde in the composer’s centenary year. 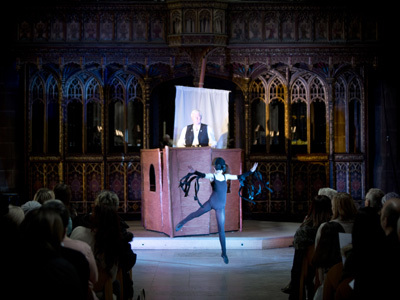 Two sold-out performances took place at Manchester Cathedral, each involving over 200 community members of all ages from across Greater Manchester. I worked with a group from Back on Track to build the ark. They were from the ‘Moving On’ scheme which helps people develop skills and a CV ready for going back into work. 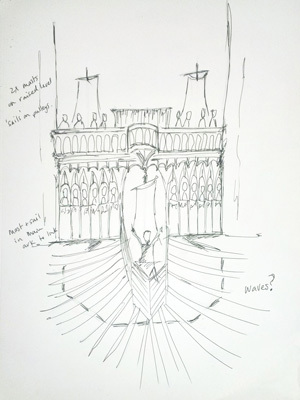 The team worked through the who process starting with a site visit to the Cathedral to go through the plans, see where the ark would be used and get a sense of the size of it in the real space. 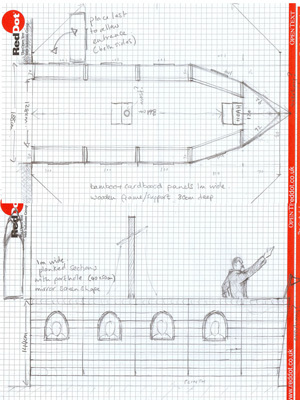 This was very useful as they went from initially being rather daunted by the task from seeing the plans to being confident and buoyed up once we had marked it all out using bamboo. 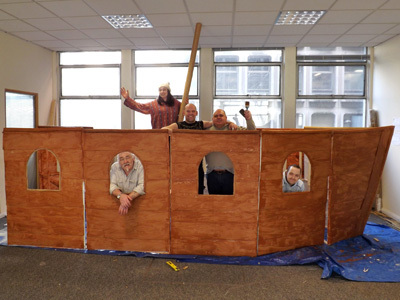 We built the ark in a space at Grumpy in the City, a scheme using unused office space in the centre of Manchester as art studios, community projects and rehearsal space. It was ideal for us. Just a big empty space but central so easy for the participants to access. We were able to tape out the plan of the ark on the floor as a guide. There were a variety of different skill and tasks needed to complete the ark. I generally got people to work in pairs as this gave them more confidence, security and focus. 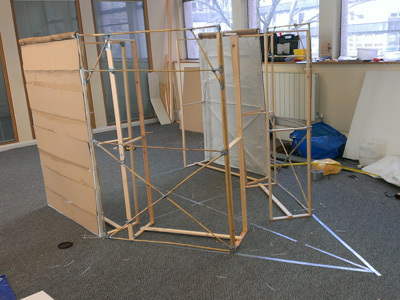 The front panels were made from bamboo and gaffer tape. 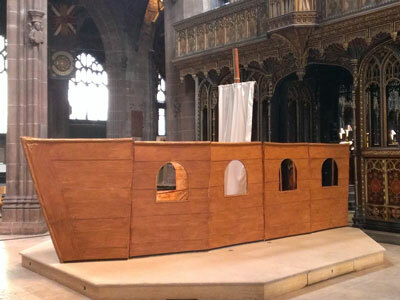 This was lightweight as the ark has to be carried in and assembled on stage by the young people. 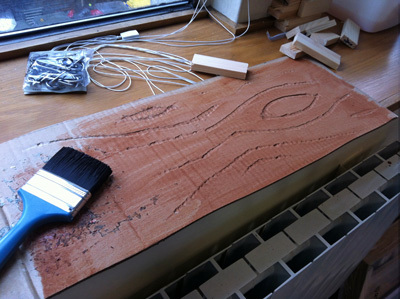 It was also cheap so less worry about mistakes when measuring & cutting. We drew up the plan on paper and laid the bamboo out on top, following the plan as a guide so all the panels would be the same. These were attached to simple wooden frames to make them stand up. 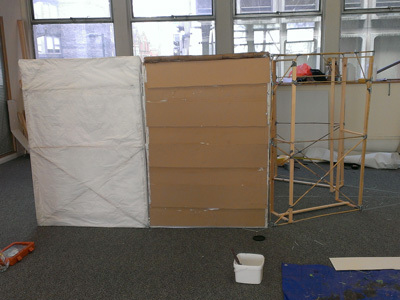 The bamboo was then covered in paper to give a bigger surface to stick the cardboard planks onto. 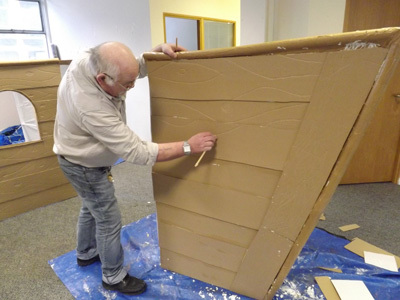 We drew into the cardboard with thin bamboo to give a wood grain effect. Port holes were cut in the sides. 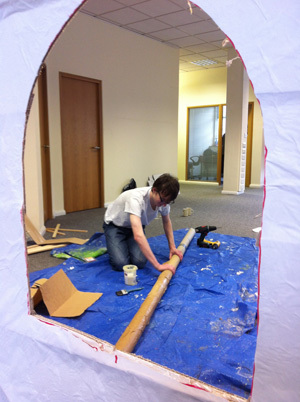 The panels were edged with insulation tube and the mast was a series of postage tubes taped together. 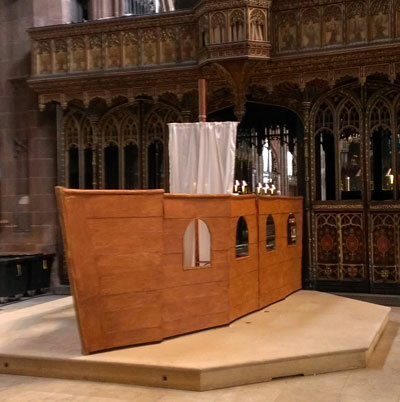 These were covered with brown paper for strength and texture and to give a suitable surface for the fence paint that we used to stain the ark. Velcro was added along the bottom of the panels. 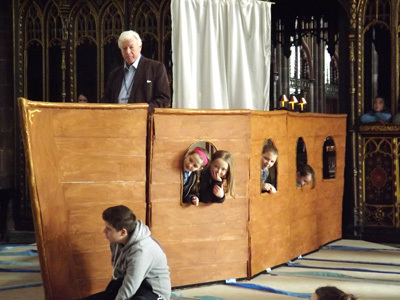 This was so the children could attach long blue ribbons to it once it was on stage to depict the sea. We only met every Friday but it was great to see the ark develop over the weeks and also their confidence. Several of them came to the show. I hope they enjoyed it and felt proud seeing their work on stage. 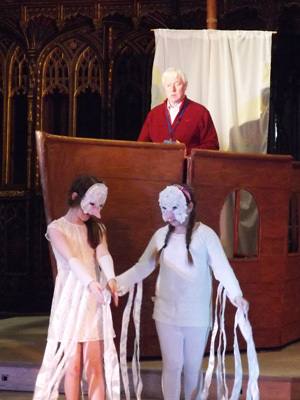 I also worked with children from three primary schools, and Cathedral choristers to design and make the animal masks to join Noah and his family on board the ark.